Today's tutorial over on Splitcoast is one of mine - it's a stamped canvas decorative lid for a canning jar! These Mason Jar Toppers are so fun to make - which is good, since I'm going to have to make 29 of them for teacher gifts this year...! There are instructions for both size lids, and the lids will fit on an open jar or a jar sealed and full of home-canned goodness. The stamped image I used here is from my latest Fall/Winter stamp release, and it's colored with Copic markers. 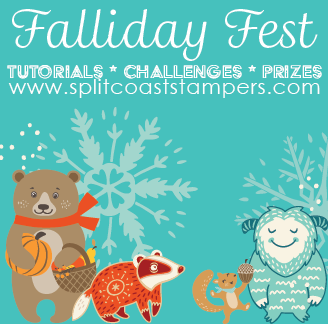 Come over to the Falliday Fest Challenge Forum for more details! Love these! I'm always looking for ways to top my gifts of jellies and jams....often just go with fabrics cut with decorative sissors--sometimes small doilies. Really looking forward to your presentation for MMA in November!